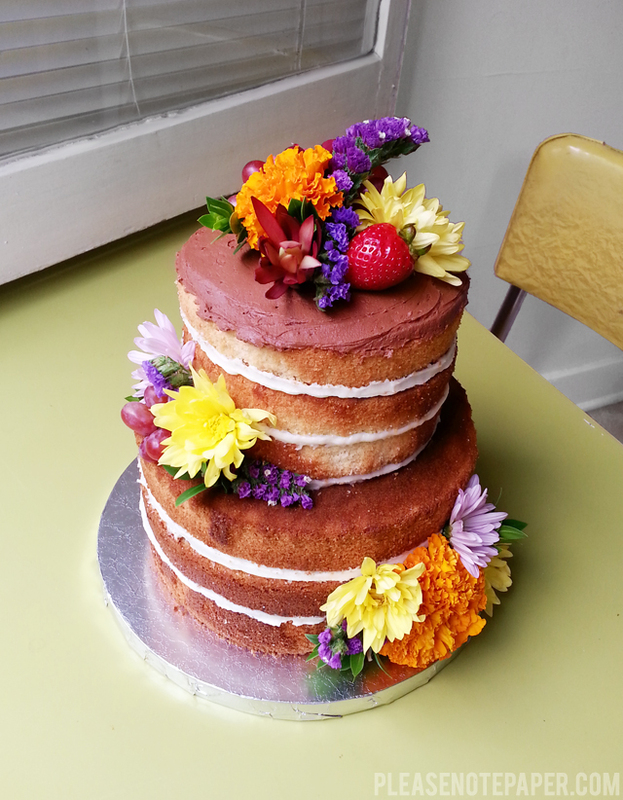 Over the weekend I attempted my first naked cake. I'm pleased with the results and wanted to share how I did it! I found some really helpful YouTube videos that explained how to stack and frost the cake. The video I found the most helpful was this one below. I even used Yolanda's vanilla cake recipe and it was delicious! It was nice and dense to make stacking and frosting the cake easy. You can find the vanilla cake recipe here. The inside of my cake was filled with chocolate buttercream. I used this recipe. I just piped a little bit of vanilla buttercream on the outside because I thought it looked nicer. I used straws as dowels and got that idea from the video below. This video is also extremely helpful. Cake Pans - I used an 6" x 3" pan and an 8" x 3" pan. I made two cakes in each then cut the cakes into 2 layers. That gave me 4 6" wide layers and 4 8" wide layers. I only used 3 of each though. Icing Spatula - This makes frosting in between the layers easy. Revolving Stand - I don't know how I would have made this cake without this stand. It's a must. Floral Wire - I used this to attach a lot of the flowers and especially the grapes. Piping Bag - I used these to pipe the vanilla buttercream around the outside. When the cake was cut, it was actually chocolate inside. Straws - These Ikea straws are thick and sturdy so I used them as dowels. The second video shows how to do this. Cardboard Cake Round - I bought this size and cut one down to be a 6" circle. It was hidden under the 6" cake on top. Cake Base - I used this sturdy silver cake base instead of a cardboard cake round because the cake was really heavy. Now that I have all of the tools, I can't wait to try it again!